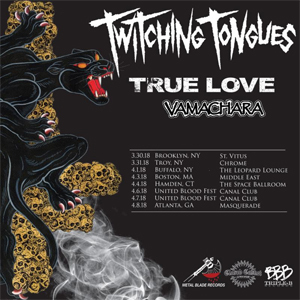 The title for TWITCHING TONGUES' fourth full-length, Gaining Purpose Through Passionate Hatred, was drawn from a quote by famed social philosopher Eric Hoffer - "Passionate hatred can give meaning and purpose to an empty life" - and it reflects the band's mentality in approaching the record: paying homage to those who supported them while belligerently responding to their detractors. With "failure" as a core theme driving Colin Young's lyrics, it also features his first foray into the political arena, motivated by the contemporary political climate to speak his mind. Directly inspired by film scores, the record has a strong epic feel, the band realizing their vision of having the music flow like a story being told. With interconnected parts, musical references and callbacks in each song, everything is tied together in a manner unlike any of their previous releases. At the same time, while maintaining the same levels of hardness and aggression that has characterized their later work, it features much more immediate and memorable melodies, which evoke the sound of In Love There Is No Law yet at the same time feel fresh and new. "AWOL (State Of The Union)"
"Defection (Union Of The State)"